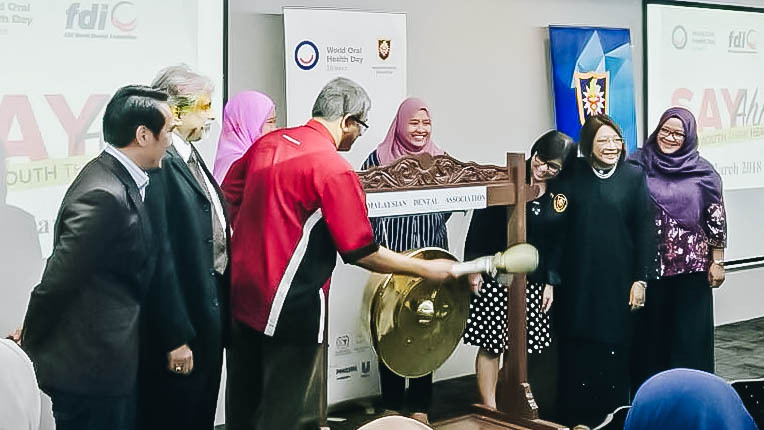 This year, the World Oral Health Day (WOHD) was officially organized at Wisma MDA, Kelana Jaya on the 17th March 2018. ‘Say Ahh’ being the theme this year, this event had received amazing support from the public. One of the main attractions was free dental screenings where the participants get to enjoy free service and also various dental booths which focused on diet counselling and tobacco cessation. Besides that, UiTM had also chipped in and organized games for the crowd, targeting all age groups. WOHD 2018 was officiated by Prof Mohamed Ibrahim Abu Hassan, Chairman’s of Deans Caucus Council, Dr Ng Woan Tyng, President of Malaysian Dental Association Dr Leong Kei Joe, Chairman of MDA CSR and his fellow committees. Towards the end of the ceremony, the winner for the Oral Health Day Video Competition 2018 was announced and rewarded. Congratulations to team Happy Teeth from UKM for their great effort!